Originally posted to facebook, and copied here for good measure. See below for the original article which started my rant. I love technology, but hate paying a premium price for it. I want to thank Jeff for giving me so many of his hand-me-down cell phones. Each of these were the top of technology at the time: Kyocera flip phone, Palm phone, HTC touch and diamond phones. For now, I'm using the HTC Snap, with an old version of windows on it. It crashes sometimes, and Microsoft has withdrawn some of its support. No matter. It comes with Office mobile, which lets me edit files, but not create new ones (so I have to make a few on the computer, and save them for use on the phone). The app I need the most? Book reader (or Palm Reader in the old days). I rarely buy new technology. I bought a new netbook computer a year ago, because I liked the wireless-N and the battery was twice as big as the MSI netbook. But Jeff is borrowing this at the moment. I love digital cameras, and own quite a few. I don't buy the big names when they're new though. I have a Samsung front display camera, which is very nice. But also a couple of Kodak, an 'old' Samsung (and other lower end cameras, like a Radio Shack Centrios). You'd think I was always taking pictures, but I usually forget the camera at home. I enjoy music, but only on my terms. So I have a knapsack full of Coby MP3 players, but just never use them! I watch music on Youtube, and then save the video from my cache. I watch those saved videos when I'm interested in music. I don't seem to use portable music players. I have a Coby player I call "the sausage." It has built in speakers, and I got it thinking I would run an English Dance using recorded music. It seems I'm not dancing much now, and certainly not teaching. Sigh. I don't like how people steal popular technology. At Finch Station (the north end of our subway network) people are frequently mugged for their Apple products. Where Abegail works, she often reports of people breaking into lockers to steal Blackberry or Apple phones. If you are willing to use less popular products, they don't attract bad guys so much. Two years ago, Abie and I both bought new electric bicycles. They were both stolen after less than four month's use. We both get sad when we remember how little use they got for our investment. It seems to me that I can live without the newest technologies. New tablets, new smart phones, new gaming machines-- if I really want them, next year they won't be new, and will probably be priced reasonably. I've been thinking about my Zune a lot since Steve Jobs passed away. You know, the revolutionary portable music device that lets users carry thousands of digitized songs around in a pocket or a purse? Oh wait, what am I saying - it's not a Microsoft product I've been thinking about. I don't have a Zune. I don't even have an iPod. I have a Coby. That's right, a Coby. A cheap plastic mp3 player - basically a $19.99 flash drive with a headphone jack, a pixilated little screen, and controls that look a lot like the original iPod scroll wheel, without actually scrolling or being a wheel. It's a piece of crap, really. And I love it. I mean no disrespect to Jobs or his legacy of attractive, functional design at Apple. I actually did have an iPod once, a sleek 30-gig number with a brilliant video screen and space for nearly half of my comically large music collection. I watched a video on it exactly once-Breaking Bad, season one-cringed with horror every time I dropped it and felt the $400 hole in my wallet for longer than I'd owned the thing when I inevitably lost it. But I don't miss it. The iPod's much-lauded shuffle function was apparently designed to highlight the far corners and aesthetic lapses of my song library. Ironic curios such as Hasselhoff, Shatner and the suppressed first Alanis Morissette CDs recurred frequently enough to constitute harassment. Having a dinner party? iTunes selected powwow drumming. Looking for a jolt of energy in the morning? Say hello to mediocre Canadian whinge-rock from 20 years ago. My portable audio technology needs are simple. A few hundred well-chosen-by me, dammit-songs and a half-dozen episodes of the WTF podcast and I'm good to go. My trusty Coby does all that, with an FM radio tuner included. (I do wish it had AM too-the crap technology of the air-but why gripe?) Most important, it's worth next to nothing so I'm virtually assured never to lose it-unlike apparently every iPhone prototype ever-and I don't cringe at all when my toddler flings it across the room. And because the next Coby is sure to be just as mediocre, I'll never need to upgrade-I've stepped off the escalators of feature creep and planned obsolescence, and all the expense and toxic e-waste that come with them. Crap technology, it turns out, is green technology. My love of the technological mediocrity goes back at least to 1980. 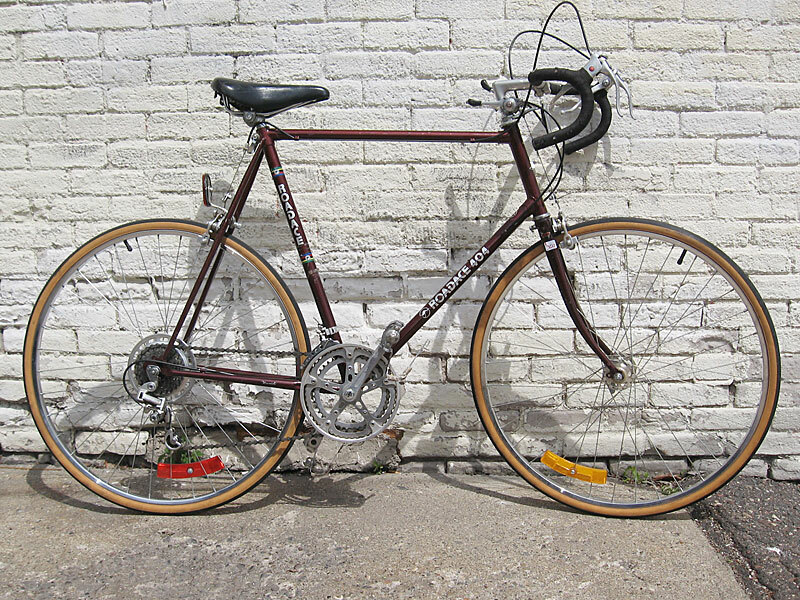 My birthday present that year was a new bike-a 12 speed no less. Oh sure, my friends on their Peugeots and Raleighs mocked, but the Roadace 404 has outlasted them all. I'm not sure I ever saw another bike of its (off-) brand on the road, but it saw me through more than a decade of heavy use, and my sister still rides it today. Me, I ride a 1995 mountain bike-practically new, I know, but blissfully free of shock absorbers and disk brakes. I've experimented with a variety of advanced travel mugs to tote a dose of morning coffee on my bike-train-bike commute. They were beautifully designed, and capable of keeping the contents plenty hot enough to scald each time their complicated drinking lids dripped slowly into my lap or dumped wholesale into my backpack. I've given up, reverting to an old pasta sauce jar with a fail-proof lid and the decency to let the coffee cool enough to be drinkable by the time I'm ready for it. Cell phones present the greatest challenge for the dedicated non-technologist. After losing three or four earlier models, I've settled on a not-smart-at-all Samsung that makes and receives phone calls (I don't pick up) and has a non-virtual qwerty keyboard that is forgiving of my sausage-fingered texting. The devilish thing apparently also has the power to connect to the Internet, but I refused to walk out of the store with the device until that feature was safely shut down. Here's what's smart about my humble Samsung: I spend approximately zero hours a day fumbling around with silly games, or trying to enjoy the latest from longreads.com on a screen the size of child's tongue. Does second-rate technology have a future? It's not for me to say. But my son, at 18 months, seems to think so. Not only does he love my "Zune"-easier for a toddler to say than "Coby" I suppose-but his own favorite technology is a little crappy, too. It's a second-hand wooden garbage truck, hand assembled by its previous owner and re-glued any number of times by me. Our kid loves the thing like the rest of us are supposed to love the new iPhone. I suspect that means crap technology has a future as bright and shiny as anything Steve Jobs ever imagined. 2011nov17 I've heard from a lot of people since this post first went up, and I'm delighted to discover how many kindred spirits I have. Several people have pointed out though that it can be hard to tell the difference between "crap" technology�functional stuff with no cachet�and the truly "crappy." No one wants the latter, and there's nothing green about using something once and throwing it out because it doesn't work. But how can you tell the difference? Fortunately, I have a crack team of super-smart Stanford students who are standing by, waiting to answer this and all of your environmental questions. We call it SAGE: Sound Advice for a Green Earth. Last year, our home was torn to bits by construction workers and plumbers, installing new valves which would prevent the twice yearly flood of effluence we have gotten here. Well, it didn't work, and yesterday we heard the awful "bluck, bluck, bluck" the toilet makes when filling up from the drain. Perhaps it will be fixed before sunset tomorrow.